Tony Chu, the cibopathic federal agent with the ability to get psychic impressions from what he eats, has been busy - busy settling into married life, and busy investigating one assignment after another that takes him to the most remote corners of the planet. Meanwhile, the people closest to Tony are conspiring to take on the brutal killer who murdered Tony's twin sister. And this conspiracy includes Tony's partner, his arch enemy - and his teenage daughter! Presenting a new storyline of the New York Times Best Selling, Harvey and multiple Eisner Award-winning series about cops, crooks, cooks, cannibals, and clairvoyants. 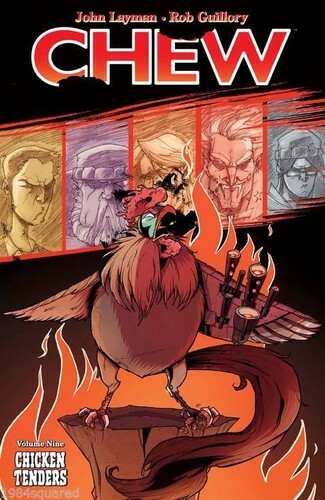 Collects Chew (2009) #41-45 and Chew: Warrior Chicken Poyo (2014).